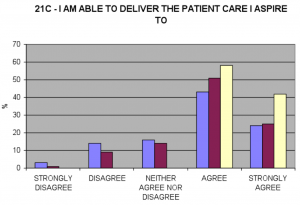 Last month, the results of the 2009 NHS staff survey were published. The work which is led by the Care Quality Commission provides trusts with information about whether staff are satisfied with the quality of work and level of patient care they are able to deliver. The good news is that across the country results were up, and staff job satisfaction has never been higher (3.5 on scale 1-5). In one unit which has successfully implemented an enhanced recovery pathway, they decided to survey all of their staff members to see what effect introducing an enhanced recovery had on staff satisfaction compared to the rest of the hospital and country. An example from the results can be seen in the graph.The enhanced recovery unit is the yellow bar, the hospital is the maroon bar, and the national results are the purple bar. As you can see the difference is striking. When speaking to staff in this unit they all viewed the pathway as an extremely positive change, and all spoke proudly when asked to explain their role in it’s development. They all thought that the pathway had improved cross department working, allowed them to use the latest evidenced based treatment, helped them to develop their personal competencies and skills, had made work more enjoyable, and above all improved the experience for patients. Whilst much work rightly goes into evaluating patient satisfaction, we should equally investigate the effect of enhanced recovery pathways on staff satisfaction. After all, units who have happy and motivated staff invariably have excellent patient outcomes.